Devaki, 76, awaits the visit of a mobile care unit, which helps her care for her disabled son. “Some of these families live in remote and far out places. They live by themselves in jungles. Access is difficult. But we find a way,” Father Elambasseril says. R. Vasudevan lies on the floor of a small room. He lives in a small hut in the Dalit village of Ittakaveli. The tropical humidity is at its peak this late October afternoon. Mosquitoes buzz around. Vasudevan was 21 when he fell off his motorbike. People around him thought he was drunk; no one called for help. Because of the delay in medical attention, his paralysis from the waist down became permanent. “I’ve been bedridden for the last 27 years now,” the 48-year-old says. “But I am mentally strong and have been able to survive this.” Despite his suffering, he radiates good cheer. Both Devaki and Vasudevan look forward to their weekly visit from the Mother Teresa care team. “The priest prays. The volunteers and the nurse make conversation. I have visitors,” Vasudevan says, smiling. 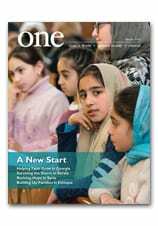 Read more about Healing the Forgotten in the December 2018 edition of ONE. A boy prepares to receive Communion during a Divine Liturgy marking the feast of the Nativity at St. George Ukrainian Catholic Church in New York City on 7 January. The Ukrainian Catholic Church and other Eastern Catholic churches celebrate Christmas according to the Julian calendar. In the video above, an Egyptian bishop describes the tremendous faith of his people and how it has been strengthened by persecution and violent attacks in his country. The Vatican's Fides news agency reports 40 missionaries and pastoral workers around the world were killed in 2018. Pope Francis greets an ambassador during an annual meeting to exchange greetings for the new year with diplomats accredited to the Holy See, at the Vatican on 7 January. Two Americans accused of fighting for ISIS captured by Kurds in Syria (The Washington Post) Kurdish forces in Syria said Sunday that they had captured two American citizens hiding out in the country’s final Islamic State stronghold. In a statement, the Syrian Democratic Forces, or SDF, identified the detainees as Warren Christopher Clark, 34, and Zaid Abed al-Hamid, 35. It said the pair had been captured alongside three others suspected of being foreign recruits in the extremist group. The center is helping those who have been uprooted to set their feet once more on firm ground — enabling them to find opportunities, rediscover community and rekindle hope. The story of the Karagheusian Center begins after the death of 14-year-old Howard Karagheusian from pneumonia in New York City in 1918. His Armenian American parents resolved to establish a humanitarian mission — the Howard Karagheusian Foundation — in their son’s memory, focusing at first on sheltering, feeding and educating orphaned children who had survived the Armenian Genocide. The organization has operated in Lebanon, Syria and Armenia ever since — now for more than 95 years. A team of 40 doctors, plus a staff of 40, serves about 4,000 patients a month at the Bourj Hammoud clinic. Of those, 3,000 are Syrian refugees and 1,000 from the Lebanese host community. About two-thirds of the clinic’s current beneficiaries are Muslim. “The health center is available to everyone, because health is for all,” stresses Lebanon Field Director Serop Ohanian. In Bourj Hammoud, the Syrian refugee population is still growing, notes Mr. Ohanian. They live in overcrowded conditions, typically with two or three families squeezed together in small, dismal apartments that rarely see the light of day. During Lebanon’s humid, cold and rainy winters, moisture hangs on concrete walls, frequently turning into mold, sparking respiratory conditions among residents. “Their situation is catastrophic, and getting worse. We’re seeing more Syrian refugees entering into poverty,” Mr. Ohanian says. Read more in the current edition of ONE.